Our Siloflex aeration hose is a unique dual surface system tested according to DIN EN ISO 9237 (DIN 53887). Test surface 20cm2. 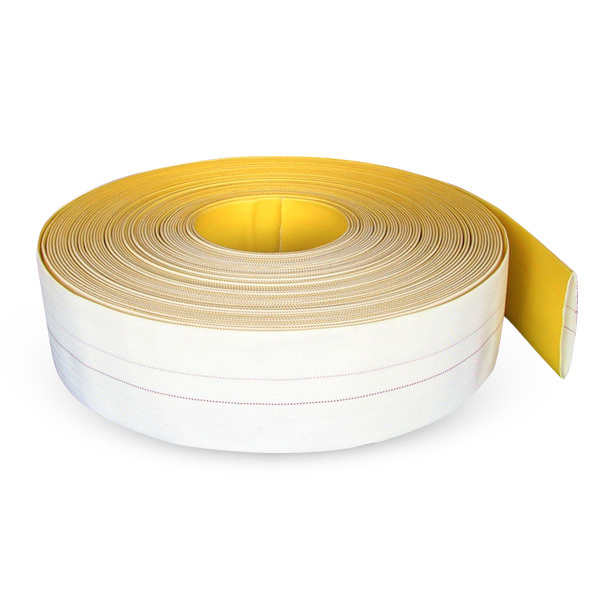 The yellow surface is Polyurethane coated increasing the abrasion resistance and most importantly sealing the polyester jacket. The opposite upper surface is uncoated and air permeable allowing flow of air to escape the jacket thus fluidising bulk powder and granular materials, to prevent compacting. Siloflex aeration hose has an anti-rot construction, is ageing and ozone resistant. Weather resistant and is minimum maintenance. The Siloflex aeration hose is principally used on the bed of bulk material and granular transportation vehicles, such as Silos, Silo Wagons and Silo train carriages. The yellow polyurethane surface is fixed down to the bed of the silo unit, one end is clamped and the other is connected to the air source thus allowing air permeability in the silo container. The hose jacket is a 100% polyester high tenacity yarn with circular woven, special plain weave with two red warp threads with defined air permeability. One side yellow Polyurethane coated, the other uncoated for air permeability. Due to its light weight characteristic Richards Hose can offer long lengths suitable for the application. Due to its light weight characteristic Richards Hose can offer long lengths suitable for the application. Maximum length 500m. It is tested to DIN EN ISO 9237 (DIN 53887) Test surface 20cm squared.